Cranberry Bliss Saltine Toffee is the best holiday treat idea! 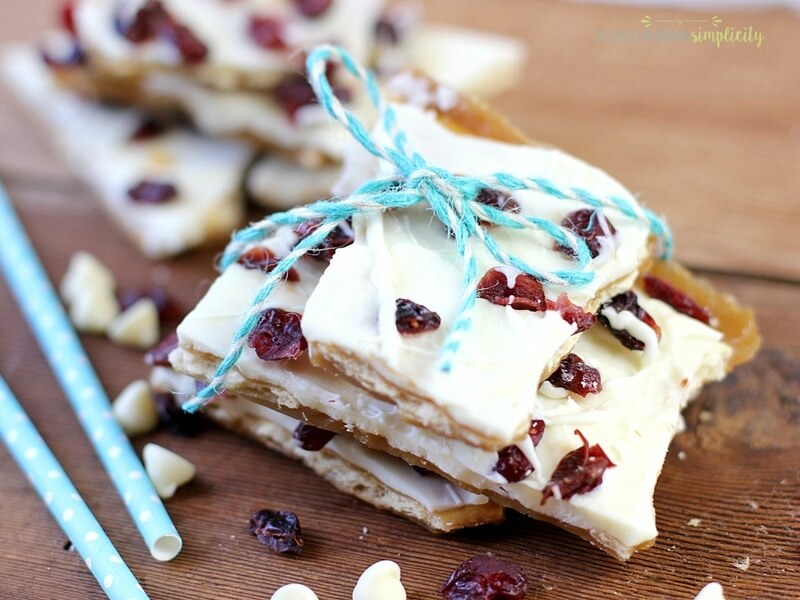 Crispy crackers, sweet caramel and melted white chocolate topped with tart cranberries. The perfect dessert combination! The first time I took a bite of a cranberry bliss bar, I was hooked! So what could be better than taking cranberry bliss and marrying it with my other favorite holiday treat – Saltine Toffee! This Cranberry Bliss Saltine Toffee is something special. Crispy crackers, sweet buttery caramel and melted white chocolate topped with tart cranberries. Mmmmm! You know why Saltine Toffee is so good? It’s that salty sweet thing. The combo is incredible. I never thought crackers would be a great dessert, but this recipe is so addictive, I was totally wrong! It is no wonder it’s call Christmas Crack! Highly addictive! This Cranberry Bliss Saltine Toffee has a slight advance over Almond Roca. It’s a little quicker to make than the traditional version, but the taste is just phenomenal. This recipe is so simple. Even those with few kitchen skills can make it! The first step, create one layer of saltine crackers on your pan lined with parchment paper or a Silpat mat. Next, combine the sugar and butter in a medium sauce pan and bring to a boil for 3 minutes. This creates that yummy, buttery toffee! So good! Then, place in a 400 degree oven for 5-6 minutes. Once out of the oven, spread the white chocolate morsels on the top. When it’s slightly set sprinkle the cranberries over the top! Push them in slightly to make sure they stay securely. Cool, break into pieces and enjoy!! Seriously, you need to make a full tray of these and keep it around all season long! Cranberry Bliss Saltine Toffee makes a great homemade gift idea. Neighbors love this stuff!! Here are some ideas to package up your Saltine Toffee as a gift for your teachers! If you’ve tried this Cranberry Bliss Saltine Toffee or any other recipe on Suburban Simplicity, then don’t forget to rate the recipe and let me know how it went in the comments below, I love hearing from you! You can also FOLLOW ME on FACEBOOK, TWITTER, INSTAGRAM and PINTEREST to see more delicious food, fun crafts + DIYs and what I’m up to on a daily basis! Preheat oven to 400 degrees. Link cookie sheet with parchment paper or Silpat mat. Combine sugar and butter in a medium sauce pan and bring to a boil. Let boil for 3 minutes. Pour immediately over saltines making sure all the crackers are completely covered. Spread evenly across crackers. Bake at 400 degrees F for 5 to 6 minutes. Remove from oven and sprinkle white chocolate morsels over the top. Let sit for 5 minutes. Spread melted chocolate and top with chopped dried cranberries. Push cranberries to in the chocolate to make sure they say. Drizzle white a little white chocolate if desired. Refrigerate toffee for 2 hours. Once set, break into pieces. Enjoy!